Gary DuBreuil, Rachel Manteuffel, and Anika Harden in “Shopworn.” Photo by Bryanda Minix. “Shopworn,” written by Derek Hills and directed by Bryanda Minix, is a story about two ideologically opposed brothers who inherit their mother’s southern thrift shop when she dies. Aided by an employee and fellow heir and one brother’s girlfriend and haunted by the voice of their dead mother, they argue about the offensiveness of different items in the shop. Jesse Marciniak was very funny as Ash… He had great comedic timing. I had some clear thoughts about my reactions to this play until I went to their website and saw it billed as a satire – a word not mentioned in either the paper program or the Capital Fringe website show descriptions. Why is that relevant? Well, the show doesn’t read at all like a satire. The play came across as determined to exalt and vilify certain beliefs in an obvious way through dialogue that we might hear in everyday downtown DC instead of influencing the audience to change their own beliefs in any particularly satiric way. Since the intention was satire, perhaps those very obvious and heavy-handed speeches were intended to be ironic. Unfortunately, the intention didn’t translate. A satire defined by Webster’s is “trenchant wit, irony, or sarcasm used to expose and discredit vice or folly.” However, there was no evidence of irony, wit, or sarcasm as the play sought to expose and discredit the value of racist artifacts. For example, liberal Dalton’s black girlfriend Molly lectures Ash at one point on how her displaying emotions doesn’t make her scary. And yes, that is a reaction that happens far too often to black women – but that’s my point. It’s literally true. It’s not satiric. If the play had been written as a drama that built on deep relationships between the characters, this moment could have been quite impactful exactly as written. But the play’s intention was not relational drama, so the dialogue felt like a soundbyte instead. Jesse Marciniak was very funny as Ash, the brother who remained in the South. One of the best laughs came from his delivery of a line about being drenched in soda from counter-protestors. He had great comedic timing. Anika Harden as Dalton’s girlfriend Molly delivered a warm and sincere performance. She was very loving towards Dalton and made their relationship seem real. Gary DuBreuil played Dalton as the overly self-righteous and obnoxious Yankee liberal which was exactly what the script called for. His character wasn’t very likeable despite his thoughtful ideologies and that was the intention so he delivered a good performance. Rachel Manteuffel was the silly referee between the trio and was amiably ditzy. I think “Shopworn” may appeal to people who identify with the Dalton and Molly’s viewpoints, but in these times I feel like a play that was truly satiric would have appealed to a broader audience’s willingness to listen and understand different perspectives and to build bridges across them, and in that respect, this play did not meet its stated goal. 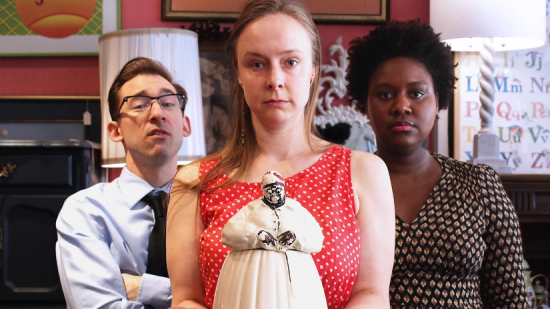 “Shopworn” runs through July 28, 2018, at the Capital Fringe Festival in Washington, DC, at Christ United Methodist Church. For more information, click here.